Are they visiting the famous cat rescue on Lanai? I would so love to go there...well, Hawai'i! They didn't say where it was. Those cats are all lovely. Of course I had to count them too and I made it 32. OH how I would love to be there and love on them. The Tabbies had to see an awful thing with the ewe noe what! I know! Should have put up an alert at the top so they wouldn't get triggered. How fun is this?! We are impressed that no one seemed excited by the appearance of dinner! I have a feeling those kitties don't want to run "afowl" of those pre-fried chickens! Wow, dat's a ton of kittehs! Ooops. I forgot how you would cope with this, BC! Holy Cat, that's a whole lotta kittehs! Nom Nom Nom. We love fried chick-hen! That's a lotta kitties all right. About 30 too many as far as I am concerned, MOL. how are those baby chickens still alive??? 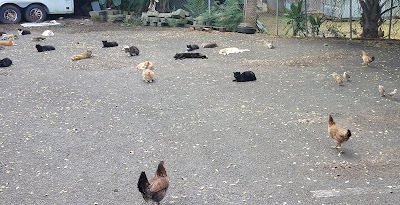 Was that at the Lanai Cat Sanctuary? ?Very famous place for cats in Hawaii---i want to go one day!